It's been four months since Enron employees lost their retirement savings, but concern about 401(k)s and company stock has not subsided. In anticipation of a change in federal laws, companies are beginning to ease restrictions on 401(k) plans, making stock easier to sell and leaving employees more confused than ever. Early Show Financial Adviser Ray Martin gives us some 401(k) advice. Everyone now knows why Enron employees lost their retirement savings. The company matched 401(k) contributions in company stock, which constituted about 60 percent of total 401(k) assets. Workers were prevented from selling their shares until they turned 50. When the Enron stock price dropped dramatically, employees lost approximately $850 million together. 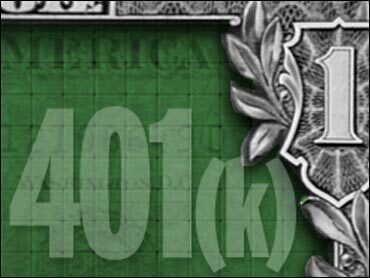 Even after this devastating loss, employees at many large companies continue to have the majority of their 401(k) savings in company stock. At Proctor & Gamble, the stock constitutes 94.7 percent of total 401(k) assets. At Sherwin-Williams it's 91.6 percent, Abbott Laboratories it's 90.2 percent and at Pfizer it's 85.5 percent. Coca-Cola, Anheuser-Busch and General Electric offer more examples. Reasons for these high percentages vary. At some companies, such as GE, the company stock is simply a better investment than other options offered by the company's 401(k) plan. However, most companies still have age-based restrictions on their plans, similar to those at Enron. Many workers simply don't want to deal with changing their investments. While the federal government can't eliminate inertia, it's making an effort to change laws concerning 401(k)s. On April 11, the House of Representatives passed the Pension Security Act, which allows employees to sell company stock three years after it is contributed by an employer. House members asked the Senate to vote on a similar bill before Memorial Day. In response, companies are beginning voluntarily to change their 401-(k) policies. Some are easing restrictions on selling company stock, while others are offering investment advice. Examples include Viacom, Sears, International Paper, Chevron Texaco, Gillette, Abbott Laboratories, Mellon Bank and Ball Corporation. This trend is reflected in a recent survey by consulting firm Hewitt Associates. After surveying nearly 300 companies with an average of 22,000 employees, Hewitt found that 38 percent match 401(k) contributions in company stock More than half of those businesses - 62 percent - have or are likely to ease plan restrictions. If you realize that 80 percent of your 401(k) assets are in company stock, don't panic. You need to look all of your retirement assets. Once you consider money held in IRAs and other investments, that 80 percent may shrink considerably. However, look closely at those other investments. Do you have money in a mutual fund that invests in your company? You may actually have more company stock than you originally thought. The classic rule of thumb says only 10 percent of a 401(k) should be in company stock. However, everyone's financial and retirement situation is different which means everyone's 401(k) also will be different. Often, employees feel comfortable holding lots of company stock because they think they truly know the company and understand where it's heading. As Enron proves, this is an illusion - particularly at large corporations. Take a look at how your company has performed in recent good and bad economic times; compare the stock performance to the S&P 500. Once you have a realistic picture of the stock, you can decide how much money you're willing to risk in the investment. If you have too much invested in company stock you have a time bomb on your hands and you need to get rid of it. However, don't sell it all at once. Instead, sell in monthly installments over the course of six months to a year. This allows for some flux in the market and helps insure that you will sell at the "right" time. It's important that you decide on a timeline and stick to it - your transactions should be based on process, not price. People get too caught up in price. The worst thing you can do is wait for a stock to come back. Think of diversifying out of company stock as a lateral move. You are not getting out of the market, just protecting yourself by diversifying your stock holdings. Ray recommends selling your company stock and getting into an index fund. If you sell GE stock this month and it goes up 10 percent next month, don't think you just lost out on that 10 percent. GE doesn't act independently; chances are, the entire market went up, which means your index fund also jumped. The short and sweet message here: the market's health/your stock's current price should not influence your decision to sell company stock. If you have too much, you need to lose it. Resulting financial losses will be small or non-existent because you are not leaving the market. Retirees who withdraw their employers stock rather than rolling the shares into an IRA get a tax break. Upon withdrawal, they can elect to pay taxes on the average cost of the shares when they were bought in the plan. Later, when the shares are sold, the gain - the difference between the current value and the cost in the plan, called Net Unrealized Appreciation is taxed at long-term capital gains rates. Given the difference between the top ordinary income tax rate - 38.6 percent and long-term capital gains rate - 20 percent this tax break can be meaningful in the following way. Assume you own 1000 company shares in your 401(k) plan that are now worth $100 a share, or $100,000, and that these shares were acquired in the plan at an average cost of $20 per share. If you were to roll the shares into an IRA and pay no tax now, and later take all 1000 shares out of the IRA, you'll pay $38,600 in ordinary income taxes on the entire $100,000 if you are in the top 38.6 percent income tax bracket, . Instead, do not roll the shares into an IRA. Take them out of the plan now and pay ordinary income taxes on the cost of $20,000. In a 38.6 percent tax bracket, that's $7,720 in taxes now. Later, sell the shares and pay capital gains taxes of 20 percent on the gain. This works out to be another $16,000 in taxes. Total taxes paid: $23,720 versus $38,600 in taxes if rolling over the shares to an IRA and taking the shares out later. If you never sell the shares and left these to your heirs, the cost basis on those shares will be stepped up to the value of the shares on the date of your death. Your heirs could then sell the shares and never be taxed on any gains!